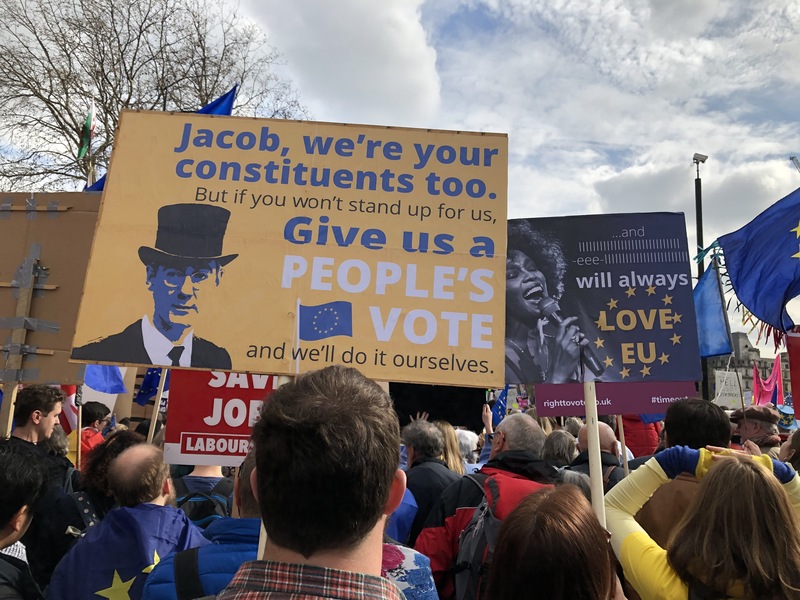 Familiar faces and new ones came together to demand a People’s Vote. Photo © Clive Dellard. 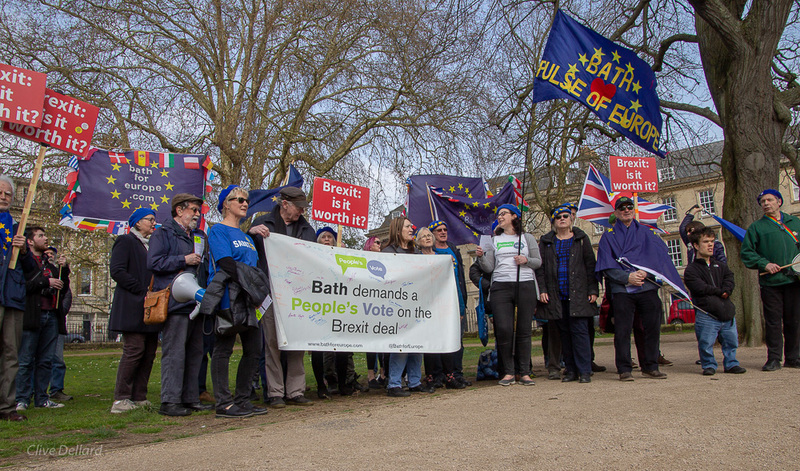 “What shall we do with a rotten Brexit?” sang supporters of Bath for Europe to the tune of ‘”What shall we do with the drunken sailor?” as part of their monthly rally in Bath’s city centre. 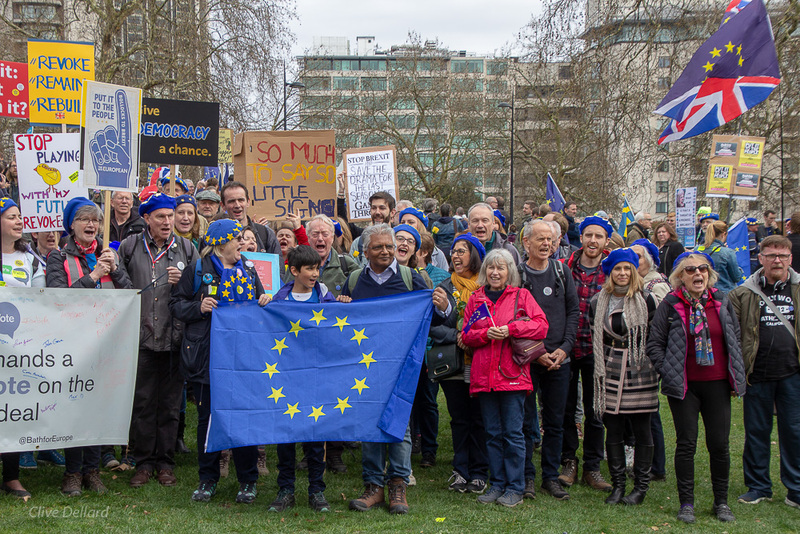 A group of about 50, wearing the blue berets with gold stars that originated in Bath and are now featured in the international press as one of the iconic symbols of Remain, marched through the city centre twirling flags and blowing whistles. A drummer from Swindon for Europe accompanied the group as they handed out leaflets demanding a People’s Vote on the final Brexit deal. Also represented were members of Cheltenham for Europe. With the government in chaos and both major parties struggling to find any kind of agreement between their members, the proposal to give the public another say on what the country should do has gathered momentum. On March 23rd a huge protest of about one million peaceful protestors converged on the capital demanding a People’s Vote and more recently a petition demanding that Article 50 be revoked if no deal can be agreed, which the government can do legally and unilaterally, attracted six million signatures. Bath MP Wera Hobhouse addressed the group. Photo © Clive Dellard. Marching through Bath. Photo © Clive Dellard.